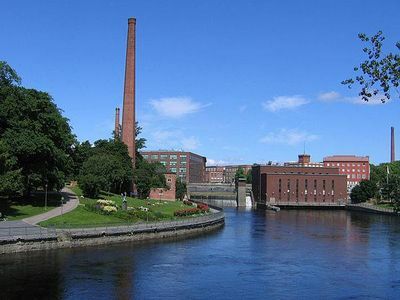 The banks of the Tammerkoski are among the oldest industrial areas in Finland. There was a busy marketplace in the 17th century. Tampere was founded on the banks of the rapids, as the rushing water provided a great deal of power for the needs of industry. There are four power stations and three dams located on the Tammerkoski. The highest in altitude is the dam between Finlayson and Tampella. From this dam, the stream is led to the power stations of Finlayson and Tampella on either side of the rapids. In the middle, there is the city's power plant and the lowest one in terms of altitude is the dam at the Tako paperboard mill, which belongs to M-real. The three uppermost power stations are owned by the city, while the powerstation by Tako is owned mostly by the municipal power company of Southern Savonia.